Now apparently this is surprising to many but I am a yeller. 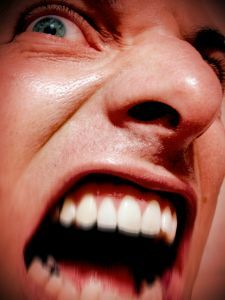 I don't like yelling and it always hurts my throat and I always instantly wish I hadn't just yelled, but there are times when I still go and yell. And I shouldn't. For the most part I yell at the one person. It is generally only one person who manages to find the right sequence of buttons that can create enough force to decimate my self control and allow anger, rage and frustration let loose. Thankfully for the most part though I can keep it all in check. Actually for the most part this person is beautiful and caring. Giving, funny and talented in many different ways this person generally fills me with an abundance of pride, love and happiness. Perhaps that is why? You know equal and opposite reactions and all that. Sometimes it is weeks without yelling. Well maybe only two but still... The yelling time is always outweighed greatly by non yelling. Not that that really makes it all ok. No one should be yelled at. Especially when love is involved. It just doesn't seem right does it? Yelling at those we love but more often than not that is the way it works out. Only I also yell at my dog. I know. Shoot me now. But he just doesn't listen to me. He thinks that the rules don't matter to me. And sometimes they don't. But sometimes they do and he needs to listen when I want him to. Surely that is not too much to ask? Anyway I just discovered something amazing. My dear old dog responds better to gestures than yelling. With a stern look and a few hand signals (pointing) I was able to send him outside much easier than when I use my voice. Hold on. Turns out I spoke (wrote) too soon. He may have followed my signals to start with but it was all short lived. He returned and has now closed his eyes so as to not be able to see me. He knows me so well. With a sleeping baby on my lap there is no way I am able to make him move. I can not yell or even move myself to drag him out the back and shut the door. Back to my yelling though. So now that I have fessed up what next? Try not to I guess. Learn to walk away, find a different way through. Let it all go and not sweat the small stuff.